With the holidays getting closer and closer, it's time to really start thinking about the gifts that could truly make them special. As much as it's fast and convenient to pick up items at the store that can be bought prepackaged and ready to go, I always try to keep a lookout for companies that can provide something with... a little bit more. That uniqueness that it going to make my recipient know I care. 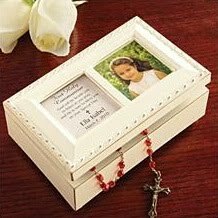 Which is exactly why, when I saw the 3,000+ high quality, personalized gifts for every occasion offered at Personal Creations, I knew that as well as finding the perfect item for weddings, babies, graduations and birthdays, that they would have the perfect personalized Christmas gifts for the family and friends on my list. From large to small, practical to frivolous, Personal Creations has a selection of everything from ornaments to stocking stuffers to home decor to apparel (and everything in between) that is customizable just for you. Whether you browse the entire collection or break it down by one of their convenient categories (for him, her, the home, etc) all you have to do is decide which to send! As it is one of my goals to start a few Christmas family traditions around here, the item that immediately caught my eye were the stylish and fun personalized Adult Pajamas. Available in youth sizes as well, how much fun would it be for the entire family to get up on Christmas morning and lounge around in these festive pajamas? 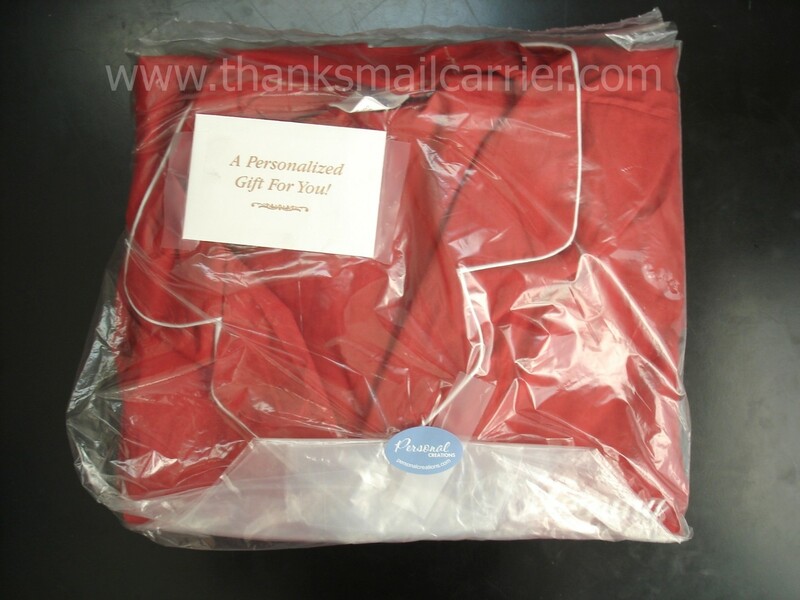 A Personal Creations Exclusive, these bright red, coat-style pj's include a long-sleeved, button down shirt with white lapels, white piping and comfortable elasticized pants. In adult and youth sizes S-XL, there's one for everyone! Plus, with the option of having any name, up to nine characters, embroidered across the front, that just makes them all that much more special to be given as a gift... or received for yourself. Which is exactly what happened when I sent myself an early Christmas gift from Personal Creations. Made of ultra soft cotton/poly blend fabric, as I pulled these pajamas out of the wrapping I found them slightly stiff at first. However, just as Personal Creations had mentioned, after each time they have been worn and washed, they have continued to soften up and get more and more comfortable. I love the rich red color, the classic white edging and overall just how casual yet chic these are to sleep and relax in. Plus, with my personalization, there will never be a question as to who these belong to or to which name I hear most in my life. For children, men or women, these personalized pajamas are a great gift idea to be used for the holidays as well as throughout the rest of the year. Who doesn't love a cute and comfortable pair of pj's? Retailing for $39.99 for adults and $29.99 for youth, these are a unique way to bring a little fun to your family or for any lucky recipient. Whether you're shopping for adults or kids (or yourself), these pajamas are just one of the vast variety of wonderful gifts that Personal Creations has to offer. For any age, interest, style or personality, you're sure to find something that will be well-received and cherished this holiday season. One lucky person will receive a $50 gift certificate to Personal Creations! To enter to win: Visit Personal Creations and tell me the name of the one of the products that you would like to give or receive as a gift. 3 Extra Entries if you blog about this giveaway linking back to Thanks, Mail Carrier and Personal Creations. Giveaway will end on December 23rd at 11:59pm CST and this gift certificate expires December 31, 2010. Do me the favor of leaving an email address or making absolutely sure it is visible in your profile, I have to have a way to contact the winner. The winner will be chosen by random.org and announced here as well as emailed and will have 48 hours to contact me or respond to notification or a new winner will be chosen. This giveaway is open to U.S. residents only. A big thank you to Personal Creations for providing a pair of Adults Pajamas for me to review as well as a $50 gift certificate for one lucky giveaway winner. The opinions shared are my own and honest and if you really need to see more, click here to see how I roll. I would like to gift the "Sisters, Cousins, Friends Throw". I entered the $50 GC to 1-800-Flowers brands giveaways. I entered the Random Line Gift Basket of 13 Games giveaway. I entered the Blabla's Basil Bunny-Maukilo giveaway. I entered the Eat Smart Precision Digital Bathroom Scale giveaway. I entered the Tillamook Baby Loaf prize pack giveaway. I would like to have the Pet Breed Memorial stone - cat....for my sweet Shadow that we lost earlier this year. I like the my daddy handprint! I would love to get the PJ for me, daddy, and JJ! You know, I never thought about getting the name "Mommy" embroidered on to any of my clothing. That is such a cool idea! I would like to receive the White Christmas Word Figurines. I like the 16" Casserole Dishes. I'm a facebook fan of Personal Creations under username Jennie Tilson. I left the comment/link on Personal Creations' FB wall under username Jennie Tilson. I entered the Wind & Weather giveaway. I entered the Gifted Imaginations giveaway. I entered the Umi Children's Shoes giveaway. The scroll tile welcome plaque is pretty. I love the red P.J.s too! I entered the Hayneedle GC giveaway. I entered the Rody horse giveaway. I entered the Crafty Kids giveaway. I entered the Blabla's bunny giveaway. I entered the giant floor puzzle giveaway. I would love to get the Rustic Snowman Hanging Canvas - 13" x 30" for my own family! So cute! Thank you! I'd love to get the Felt Snowball Stockings. I am so totally in love with the Rectangle Crystal Photo Necklace! I love the -My Daddy's Hand Print- would be a great gift for my husband. And I like the Locker Room Prints as well. I "like" Personal Creations on FB. Left Personal Creations a message on their wall. Became a fan on FB. I'd love to give my daughter the spiderman hoodie! i like the personalized pet ornament. id love to have my dogs name on one!